Nate Hawthorne reviews Solidarity Federation's upcoming pamphlet, Fighting for ourselves: anarcho-syndicalism and the class struggle. 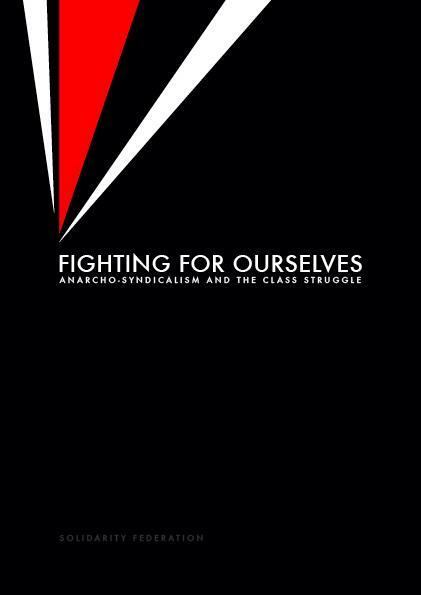 In October you should get a copy of a new pamphlet called Fighting for ourselves: anarcho-syndicalism and the class struggle by the UK revolutionary organization Solidarity Federation or SolFed for short. SolFed gave us permission to post some excerpts of the pamphlet and reviews. All radicals should read it, particularly IWW members and people in anarchist political organizations. Part one: Read the pamphlet. Seriously, read this pamphlet. If you can, make other people read it and discuss it with you. You can get it on paper in North America from Thoughtcrime Ink. The pamphlet provides an excellent overview of material relevant to radicals today and provides suggestions for further reading for people who want to follow any of the threads further. All the ideas covered come out of serious experiences of struggle and are worth engaging with in a sustained way. Likewise, all the historical moments the pamphlet covers are important. It’s useful and important to have a sense of memory of our political ancestors. Even those of us who aren’t direct political descendants of these experiences benefit by learning about them, and knowing that people in the past fought for a better world, and knowing what they tried and how, and what they thought. The first chapter of the pamphlet goes over the history of unions and political parties which haven’t sought to end capitalism, and a few that were socialist but/and ended up contributing to limit working class people’s lives. As the pamphlet points out, a lot of these same forces are around on the left and in the labor movement today, so this history has contemporary relevance. The second chapter goes over some radical currents that proposed a new society while also not falling into the statist (and, I would argue, still capitalist) trap of the socialist countries. The chapter talks about some anarchist, marxist, and union-centered (that is, syndicalist) political traditions. I appreciate the diversity of traditions represented in this chapter. SolFed are anarcho-syndicalists and proud of their tradition, but this pamphlet doesn’t try to keep people away from other traditions. It encourages engagement with currents SolFed disagree with, and shows how SolFed draw from and learn from other currents. The next chapter focuses on anarcho-syndicalism, where SolFed are at home ideologically. The chapter presents the history of anarchist unions in several countries, looking at these organizations’ experiences and their ideas, including groups that are still around today like the CNT in Spain. I especially liked how this chapter presented anarchosyndicalism as made up of disagreements and different experiments, rather than as just one flat thing. Instead of “anarchosyndicalists everywhere are always like…” the chapter presents a variety of anarchosyndicalist organizations’ ideas and actions in different places. The last chapter focuses on SolFed’s politics: what they aim to do in the short term and what they hope will unfold more long term and at a larger scale. It’s hard to summarize this, but the chapter argues for taking on realistic fights that build organization and spread radical ideas among the working class, with the eventual aim of seizing control of the economy and society. This included workers taking over their workplaces without compensating capitalists, and beginning to form a new kind of society. IWW members in particular ought to read this. We emphasize working class struggle in waged workplaces. SolFed have a similar orientation, so we should learn from reading their views. Furthermore, their orientation toward how to struggle is similar to the approach favored by many of us in the IWW. The history provided is relevant as well, emphasizing people who have worked on working class struggles in waged workplaces. Some are people we have affinity with, especially the revolutionary unionists, and some are people we criticize, but all of them are worth IWW members knowing about. Anarchists in North America should read the pamphlet too. A lot of anarchists have no real interest in workplace organizing and little understanding of class. This pamphlet will provide them with a good account of radical currents that emphasize the working class and waged workplaces. People who don’t see that as important should read this as a challenge to their views. Other anarchists who believe in the need for formal anarchist political organizations separate from unions and similar organizations will find a different sort of challenge in this pamphlet. Namely, it suggests that we don’t need political organizations separate from radical fighting organizations like unions. All fighting organizations have some political perspective, with a lot of variation in what those politics are. From the perspective advanced in this pamphlet, it is possible and actively desirable for unions and similar fighting organizations of the working class to have a revolutionary vision. I could imagine some people saying “Reading?! There’s a crisis on! We need to hit the streets!” Sure, but we need to be equipped with an analysis of how capitalism and the state operate, and with a social vision to help us talk about what we want instead, and why. What people want shapes how much and how hard and how long they will fight, and when they’ll go home. Karl Marx famously posed a distinction between the slogans “a fair day’s wage for a fair day’s work,” expresses a vision of achieving some kind of supposedly livable capitalism, and “abolish the wage system,” calling for the end of capitalism and the beginning of a new society. If we don’t have arguments about our political perspectives, we’re going to have a hard time convincing other people not to go home when they get offered a deal that seems relatively fair to them as an individual or for their section of the working class. If people only imagine a better capitalism then they’ll go home instead of stay and fight once the capitalists off them that slightly better deal. Of course radical analysis don’t magically solve all problems, but they do matter. That’s one area where I wish the pamphlet said more, in that I wish the pamphlet had a bit more on SolFed’s understanding of capitalism, and perhaps if it had an opening that was designed to make a pitch for the pamphlet’s radical ideas to people who aren’t already radicals. These concepts are especially clarifying personally, for work that some friends and I have written about labor law and contracts.1 Using these terms, I would say that over all I and several others have been writing about various ways that law encourages the representative function and the representative function encourages legalism. And I’d say that we’re all concerned with how this effects the associational aspect of our organizations and other unions. Law is an institution of repression but also one of representation, and not just collective bargaining. There are state-provided independent agencies of representation, in the sense of independent of the employer. And even when law is repressive it encourages recourse to representation: lawyers are a kind of representational specialist. Furthermore, law encourages the growth of a layer of people who are specialists in connecting the organization or individuals to the agencies of representation. SolFed write that “desire for economic representation makes perfect sense in the absence of a revolutionary perspective, just as the desire for political representation – i.e. suffrage – makes sense in the absence of an anti-parliamentary perspective. If you are not opposed to the capitalist system, representation within it is the most you can ask for.” I want to point out two things about representation. Representation is in part a relationship between the members of the union and the parts of the union that are currently embodying the representative function, that is, the representatives. Representation is also a relationship between union representatives and employer and/or state representatives. Some of the tensions in unions are about how representatives’ relationships with bosses and their relationships with union members work. Many on the left are used to talking about union representatives as limits on workers struggles, but this is not always the case. In order for unions to represent workers to bosses or the state, the bosses and the state have to be willing to sit down at the negotiating table. They aren’t always willing to do so. When governments and employers are unwilling to negotiate (which is to say, in part, unwilling to accept workers’ representatives and meet with them) the relationship between the representative personnel of a union and the rest of the union can change. If bosses won’t negotiate this can make representative personnel more desperate in relation to union members, in order to justify their positions, and/or pushing the organization toward things like lobbying for legislative change, election recalls, and so on. At the same time, sometimes representative personnel can become oriented toward more militant struggle with bosses in order to bring the boss back to the table. I’ve used a metaphor of a kerosene lamp to describe unions, I think it expresses some of the relationship between representation and association. A kerosene lamp has components that create fire, that sustain fire, that contain fire to keep it from getting above a certain temperature and from spreading or joining up with other fires. Unions create class conflict, sustain class conflict, manage class conflict to keep it from getting too hot, and prevent it from spreading around the class. Which of these activities unions engage in at any given moment has a lot to do with the strength of the representative function, employer and state willingness to negotiate, and the specifics of the union’s associational life. I’ve been saying for a while now that we’re in a time when employers and government see less need to negotiate and that this creates more room for militancy on the part of social movements, and makes it more likely that radicals may become influential in movements. This point comes in large part out of some discussion with a comrade from SolFed and from reading an early draft of a portion of Fighting for Ourselves, specifically the discussion on the history of syndicalism. We might say that employer and government disinterest in negotiation discourages the growth and operation of the representative function in workers organizations. If workers fight more aggressively, however, we are likely to see a re-enlivening of employer willingness to negotiate, which is a condition that encourages the growth and operation of the representative function. When the bosses won’t negotiate, smarter and more sophisticated specialists in representation will encourage worker to fight hard to restore the conditions for representation to ‘work’. I think this point is important for two reasons. First, it suggests something to watch out for in the not-too-distant future, because if the employers and governments become more willing to negotiate this will further encourage the growth of specialists in the representative function within workers organizations, and encourages the channeling of workers struggles more toward working within and through representative channels. Second, it’s worth noting that the workings of the representative function of unions under capitalism can involve significant friction and conflict. This is true with the operations of capitalism generally: it often involves very serious conflict. We should not mistakes the intensity of conflict for an anticapitalist character of a struggle. Changing gears, SolFed call for unions that are just made up of the associational function with no representative character. I don’t think it’s possible for unions to exist under capitalism without some kind of representative function. Even if workers hold an assembly and make decisions then present demands to the boss as a whole group, this a kind of representation, though a very minimal kind. I would say that what we are primarily after is being representative minimalists. I would say that what some of us have talked about as ‘direct unionism’ is in part an argument for representative minimalism. We may make tactical use of representative measures and institutions, but we should be aware that doing so can channel us in a direction that encourages problems. We don’t want the representative function in our organizations to grow, we want it to shrink as much as possible, so that if we resort to representation we should be careful that it doesn’t shape our organization in negative ways. This is easier to say than to do. There are real differences in experience and skill in our organizations, which can become inflexible divisions of labor or hierarchies, where some people are specialists in some kinds of work and become autonomous of/autonomous within the organization, breeding problems of (or a lot like) the representative function. One way that the representative function can become more important, and more of a problem, is with an impulse to grow at all costs. As SolFed write, “in order to gain the right to negotiate on workers’ behalves, representative unions tend to jettison any explicit politics which could put off potential members.” Some of the slogans that can go with this include “let’s get serious” (as if everyone else is just playing around) or “we need to fight to win” (as if everyone else is trying to lose), as a way to say “let’s not talk much about our long term social vision and analysis of society.” This is one reason why I’ve started to be less interested in the old slogan that “direct action gets the goods,” because I think that we want more than just goods, and we want goods because of our core values and moral vision. If an organization is primarily about getting satisfaction under capitalism, the organization has serious limits. This is why it’s important that we have a radical perspective. As SolFed rightly say, without a radical perspective, the best we can hope for and all we really want is representation under capitalism. In this second part I’ve responded to and made use of some of the categories in Fighting for Ourselves, in large part because I think the categories are interesting and illuminating. I think they’re valuable on their own terms and that they help make sense of some discussions that some of us in the IWW have been having, in person and in writing in the Industrial Worker, here on Recomposition, and on libcom.org. I hope this discussion helps make you want to read the pamphlet. Definitely read it. People who read it are welcome to comment on it here, and to submit reviews. I’d really like to see as many people as possible in the IWW read it, and see it reviewed in the Industrial Worker. Fighting for Ourselves is an excellent contribution to helping people understand some important history and some insightful theory relevant to revolutionary unionism today. As such, it makes a good contribution to projects of building revolutionary unionism in practice. 1. I’m thinking of several pieces, including the ongoing discussion on so-called “direct unionism,” Juan Conatz on contracts and the IWW, Phinneas Gage on contracts, my stuff on the history of collective bargaining and the role of the state, Kevin’s article on IWW overuse of unfair labor practices and how some IWW campaigns defer too much to lawyers and some members become specialists in ULP proceedings, and my stuff on Occupy Homes and mortgages and specialists. That writing has felt relatively disparate to me before but I would now say it’s all about law, the representative function, and the associational function. "Anarchists in North America should read the pamphlet too. A lot of anarchists have no real interest in workplace organizing and little understanding of class. This pamphlet will provide them with a good account of radical currents that emphasize the working class and waged workplaces. People who don’t see that as important should read this as a challenge to their views. Other anarchists who believe in the need for formal anarchist political organizations separate from unions and similar organizations will find a different sort of challenge in this pamphlet. Namely, it suggests that we don’t need political organizations separate from radical fighting organizations like unions. All fighting organizations have some political perspective, with a lot of variation in what those politics are. From the perspective advanced in this pamphlet, it is possible and actively desirable for unions and similar fighting organizations of the working class to have a revolutionary vision." While I agree with the thrust that unions should have a revolutionary vision. The Solfed and many other A/S are political organizations as they are not unions. They may be initiatives towards that end, but they are not fundamentally what you are suggesting. I find nothing wrong with A/S political organizations or "pressure" groups that are not actual unions. I mean, there should be a place where folks with similar ideology and tactical perspectives should be able to gather, develop and act in concert. To a large degree, that what it appears Recomposition is about. To be a sort of political pressure group within the IWW. No doubt the goal for a/s is the building up of a class-wide revolutionary movement: both on and off the job. I'd like to hear what SolFedders say about whether or not their a union and about their goals in terms of becoming a union. There's already a long discussion on political organizations, on Juan's blog, and that gets into what recomp is and isn't so I'm not gonna get into that. Don't matter. You stated something I don't agree with, that really all. We don't got to debate it. You stated a viewpoint, which I disagree with. Very simple. @syndicalist, i really do not know what makes an actual union, some use that same rhetoric against the iww, and we're both members, lol... also I trust the SolFed comrades that they are honestly an initiative towards forming a revolutionary union, and are not only a political organization anymore at least within the confines of being a traditional IWA style propaganda group. Namely, it suggests that we don’t need political organizations separate from radical fighting organizations like unions. All fighting organizations have some political perspective, with a lot of variation in what those politics are. From the perspective advanced in this pamphlet, it is possible and actively desirable for unions and similar fighting organizations of the working class to have a revolutionary vision. At this point I think it really makes sense to have organizations that can engage in class wide organizing, based on autonomous struggle, that have revolutionary aims. But an as anti-state communist, i.e. anarchist I do say I'm a bit partisan about the type of vision I'd prefer such fighting organizations to take on. Also the question on what type of activity such fighting organizations take on is still up for grabs IMHO. I've heard varying opinions from SolFed will do community and workplace organizing, to there should be a movement division of labor, to the IWW is all we need to do everything, to the IWW should only focus on the workplace... so in the interests of being constructive, what do people think about those potential choices, and more importantly for me revolutionary pluralism? As I see it a group that does both community and workplace organizing could still keep open space for revolutionary pluralism and autonomy of other organizations, as much or as well as ones who only focus on one specific issue. Should we have anarchist (fighting) organizations of struggle, or do more open collaborations between anti-capitalists make more sense? Should they focus only on one area of struggle or multiple? Should they or should they not take a position of revolutionary pluralism? PS: Great review, and excited to distribute my own once the pamphlet is officially out for the world to see. I think regardless if SolFed is a political organization currently, they are obviously moving outside that (having explicitly rejected it), so with this fact in mind, nothing about what the pamphlet or Nate said there really changes. Does anyone have a copy for overseas comrades? Chur. We're finding out international shipping rates asap, as there's been a few enquiries from Australia. We're working out what to do with the next print run now as demand has been much bigger than expected. It will probably be available via either the SF website with Paypal, or via a distributor if we can work something out. We're also hoping to put a free ebook version online, but no release date set as someone needs to sit down and lay it out. After christmas, we're also going to be looking at translations, once we've had time to see how it's been received. So if any international comrades would like to see it in other languages, please let us know (SF Publicity Commission mandate is with the Brighton local until May, so brighton[AT]solfed.org.uk). Can someone please post the link Nate is referring to, thanks. I wonder if it wouldn't make sense to start a new one, not tied to a particular piece or author's thoughts (avoiding inevitable calls of "NOT RELEVANT TO OP!"). That thread itself also goes off on some very specific tangents to a particular US group (you know who you are ). I was also looking again recently at the responses on the "Analysis of WSM" thread that ends up also discussing this towards the end of it. I'm sure it comes up elsewhere, too. This is great Nate. If I have more time, I want to respond in detail later to some of the points you've raised in the latter parts of your review. This is one reason why I’ve started to be less interested in the old slogan that “direct action gets the goods,” because I think that we want more than just goods, and we want goods because of our core values and moral vision. This is certainly veering from the point of your article, but I'm curious of the use of the term moral here. Do we have a moral vision? Like I said, I'm being pedantic, but I think we're dealing more with a material one. hey Chili, glad you like the review and I'd love to hear your thoughts on the points you alluded to. On the moral thing, I dunno if we agree on the term and I'm not committed to it in the sense of having a strong argument for the term (though I am committed to in an kind of inertia way - it's the word I use and will keep using unless argued out of it). What I meant was two things jumbled together. One, we have a vision of a new society with a bunch of qualities, and we have a lot of criticisms of the current kinds of societies. That's kind of vision for the future and a kind of analysis of the present, defined by our values. We don't have to call that moral (though I'm personally gonna keep saying it is, short of an argument that doing so is a mistake). Also, I think a lot of people don't so much want money as they want the stuff that money gets them. And a lot of the stuff that they want is a means to an end as well. And some of those ends are about people's core values. Like for me personally, I want health insurance, and I want that because I want to be around to meet my grand kids if I'm lucky enough to have some, and I want my family to be safe and secure. And I want to work less so I can spend more time with my family. All of that is a matter of goods, but goods in an expansive sense of the word, goods I want because of stuff that is for me really fundamental. Again I'm not committed to the term 'moral' here, it's just what I call it. If folk want to call it something else, that's fine, though I suspect that whatever other term folk use will just be a synonym for the same point. If you live in North America you can order it from Thoughtcrime Ink. thanks for that link, just snagged a hard copy for myself. Changing gears, SolFed call for unions that are just made up of the associational function with no representative character. I don’t think it’s possible for unions to exist under capitalism without some kind of representative function. Even if workers hold an assembly and make decisions then present demands to the boss as a whole group, this a kind of representation, though a very minimal kind. I would say that what we are primarily after is being representative minimalists. I was reading some Pierre Clastres the other day, and it reminded me of this discussion. Clastres argued that 'primitive' societies hadn't somehow failed to 'evolve' into 'more advanced' forms, i.e. more hierarchical ones, culminating in the modern state. Rather, they had recognised the danger of hierarchy emerging and actively adopted practices to keep that potential at bay. David Graeber says something similar in Debt about an innuit community. It wasn't that they didn't understand economic calculation, but that they understood it better than their educated interlocutor - and knew that individual self-interest would tear their society apart, so successful hunters made a gift of their surplus meat to their neighbours, who returned the favour when fortunes reversed. We might say that employer and government disinterest in negotiation discourages the growth and operation of the representative function in workers organizations. If workers fight more aggressively, however, we are likely to see a re-enlivening of employer willingness to negotiate, which is a condition that encourages the growth and operation of the representative function. When the bosses won’t negotiate, smarter and more sophisticated specialists in representation will encourage worker to fight hard to restore the conditions for representation to ‘work’. So the question is what these conditions are, and what the processes are that ward off the emergence of the representative function. I'd say these aren't just formal (mandates, recall etc), but also informal/cultural, about whether bigger egos and personalities are deferred to or made to defer to the collective and things like that. The cultural side is probably more important than the purely formal mechanisms, but harder to specify, let alone design. I'd guess that union bureaucrats have the opposite problem, paranoid as they are about warding off the ever-present potential for 'cancerous' autonomous associational activity. I agree about the informal and cultural stuff. I think rather than thinking of this as like 'what causes representation' for me I think of it like 'lots of things cause representation, including...' I'm personally interested in the role of labor law in encouraging the representational function, because I think it's been important in US history and because I think we're likely to see some big changes in the legal system in the not too distant future, which will re-organize the representational function. I think it's also probably helpful to think of representation as a how rather than a yes/no. Sorry, that's not clear. Like what I mean is, what are the ways groups shouldn't engage in representation in relation to bosses and the state, and also how should groups conduct themselves internally in relation to representation (stuff like rotating officers etc). It seems to me that the most important measures of all this are in how the forms of representation effect (affect? I can never remember) the associational function - how do the ways the organization represents itself shape the life of the organization? IMHO this is different from 'what is the monetary pay off/what is the win made possible' by different sorts of representation. (This one's contentious in the US with regard to stuff like labor board elections, with some comrades arguing that these are necessary to win gains and others arguing - I used to, all the time - that these elections are actually a pretty terrible way to win gains. I think that's still true mostly, but I think the 'what do we gain' question is just not the right question.) That all feels super abstract, sorry, best I can do at the moment.